We are told that a certain sort of Novus Ordo cleric complains that the current 2010 English translation of the Roman Rite is difficult for him to read. He certainly (judging by two OF Masses I attended last summer) does sometimes have difficulties: taking breath at the right times; pausing; emphasising ... all those little tricks by which a crafty hierophant conveys the impression that he understands what he is saying. The poor dear poppets. They, impoverished souls, may have no ministerial background in delivering liturgically the rolling Tudor periods in Dr Cranmer's Book of Common Prayer. I pity them. Of course they are going to have trouble with any text that goes on for more than a dozen words without a full stop or colon. OK; fair enough. But one thing really does puzzle me. There are four words which they seem so often incapable of saying ... three of them monosyllabic ... "The Mystery of Faith". Those four words, of course, are intended to refer to the Mystery of the Great Presence. That is why they were originally within the Verba Domini. I once wrote a piece about this, which I imagine would be accessible via the Search Engine attached to this blog. Ah, well. Perhaps things are better in seminaries nowadays. 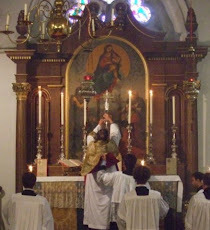 Perhaps the chaps do now get some input, both about the meaning of the Liturgy and how to celebrate it. How to breathe, for example. But what those older clerical chaps do demonstrate, by their endless propensity to change the words, to ad lib their own interminable clevernesses, is this: they obviously find the Novus Ordo (both as composed and as translated) very deeply unsatisfactory; inadequate to meet their own needs and what they assume to be the needs of their people. Well ... 'traddies' find it unsatisfactory ... this other 'trendy' lot does too ... so there seem to be an awful lot of clergy who dislike the OF, once you add both those opposing groups together. I do. This is what I've been fed with since the day of my birth. I would like it to be celebrated as intended (do the red, say the black kind of spirit). And I'm hoping for the success of a still improbable but unavoidable reform of the reform plan. When I was growing up, all the priests in my parish were great doers of the red and readers of the black. Most of the parish priests in most of the other parishes where I've lived were similar. I've had plenty of opportunities to appreciate their lack of... creativity... in other parishes. All the same,I do have to say that I've never heard anybody say anything at that part of Mass except "The mystery of faith." Even the priest who liked to embed the entire Mass in a sort of explanatory lecture didn't elaborate on that one. Heck, even some of the craziest liberal priests liked to chant that phrase, even when they didn't chant much else. Somehow, that generational quirk must have skipped my area. Every so often, I think that US seminaries in the East or around Ohio have been uniquely bad. And then, I learn to count my blessings for what we have had, even at the darkest times. Funny how that works out. I find that chanting the collects helps me sort out the right pauses and cadences. As it happens, isn't that what the Church encourages priests to do? Two comments, despite your purdah. Having three possible responses to the 'The Mystery of Faith' is an absurdity. One versicle one respond is an essential liturgical principle. The ICEL 1998 orations were almost always better that what we now have. Do not forget that it is not just the educated who need to be edified, these texts are used in the slums of Manila as well as Milwaukee and Manchester. Yes. I am a young (34 years old) priest who truly loves and prefers the Ordinary Form of the Mass, celebrated reverently and well with attentiveness to the words, rubrics, and tradition. Dear Father, I fear I see a discrepancy. Did you not, on 10 July last, tell us "The Novus Ordo rite as commonly presented is not the Roman rite"? And now you say "We are told that a certain sort of Novus Ordo cleric complains that the current 2010 English translation of the Roman Rite is difficult for him to read." You did explain that there is one condition that could allow the Novus Ordo to be included in the Roman Rite, the use of the Roman Canon, but this is vanishingly rare, although I actually heard it last Saturday. Given that rarity, can we have clarity on at least this question: is the Novus Ordo a form of the Roman Rite? I learn a great deal from you and I am grateful. Father, what you are saying— wittingly or unwittingly, I cannot say—is that the best way to celebrate the NOM is to say it as much like the TLM as the rubrics and text will allow. Thank you, Savonarola. I am aware of SP, but I was referring to Fr. Hunwicke's argument on the matter of whether the NO is the Roman Rite. I thought his July 10 post was convincing. If the Pope Emeritus would like to comment, I would be most willing to listen. Matt Smith -- Of course it's the best way. It's the only way that most of the Council Fathers could picture it being done, and it's the way implied by the rubrics themselves. Probably it's also best that you have breathable air and gravity. We'd be better off if all the various options at different places in the liturgy were removed. In the Mass, not only the different "memorial acclamations", but the introductory rite variations, and the choices among penitential rites. As reasonable as these options are, they introduce and legitimize the notion that the celebrant has a liturgical sense superior to what can be set down as a fixed rite. There is no strongly principled gap between choice among options and straightforward extemporizing.